Make sure you throw out any uneaten, discarded fruit and replace it with fresh fruit each day to avoid causing disease. Do not feed human food such as cake, cookies, candies, soda, alcohol, caffeine or chocolate. These can cause health problems and obesity. Do not encourage parrots to fly onto your body and eat from your hand. This can make them too trusting of humans, and possibly endanger them in the future. Put out a fresh, clean container of water, and wash the bowl every day. Buy a parrot feeder. Look in your nearest pet store or classified ads, or do an online search. You can order one or several feeders, depending upon how many parrots are in your area. Put clean, shallow, ceramic dishes in a safe area of your garden. Place the dishes on concrete blocks, a tree stump or on the ground if it is free of cats, dogs and traffic. Put fresh fruit such as apples, bananas, mangoes, berries, pears, ripe figs or most other kinds of fruit on the feeders or dishes. Do not offer the parrots avocados or rhubarb; these are poisonous to most parrots. Look in the pet store or online for wild parrot food; this is a mix of seeds, nuts and dried fruit blended especially for wild parrots. Fresh food is better at attracting parrots, but pre-mixed seeds will suffice. Give the parrots nuts in the shell, such as almonds and peanuts. Put out sunflower seeds chosen especially for wild parrots. You can buy these in many pet stores and grocery stores. Parrots will also eat corn; although this isn’t a staple of their natural diet. 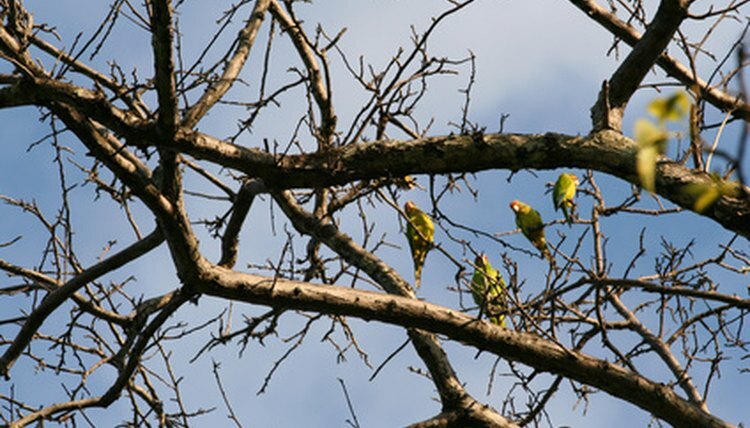 Parrots can adapt, and enjoy a wide range of healthy, natural foods. Hang treats and fruit on trees if you have them in your yard or garden. Use a natural twine such as jute or hemp to hang food from trees. Parrots will chew things, and it’s best not to give them any substance which may be toxic.